In a dream world, most New Yorkers would go about their days without having to interact with another human -- freely hopping on the subway without having to push past an unruly middle-school field trip, getting bagels without having to talk to the curmudgeonly coffee cart guy, and doing work in peace in a miracle office made just for one. Well, we just got a little bit closer to the dream. 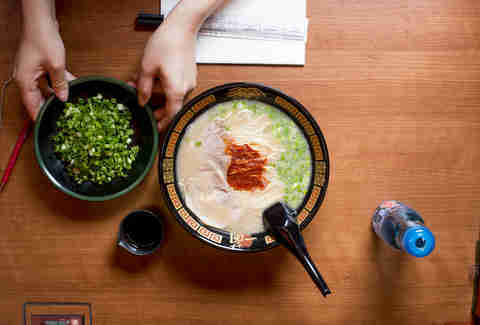 After nine years of plans and rumors, popular Japanese ramen chain Ichiran has finally opened its first US location in Bushwick, Brooklyn, and in addition to its specialty tonkotsu (pork) broth and handmade noodles, it’s also known for “low-interaction dining” -- i.e. eating a meal without interacting with a single other person, not even your waiter. Perhaps opening day wasn’t the best time to visit a restaurant made for “low-interaction” dining. I chose an available seat from the electronic seating chart, then had to push my way through several people to get to it. But when I finally sat down at the solo-dining booth, complete with a bamboo curtain divider between me and the server, that dreamlike antisocial nature of the meal fully kicked in. I filled out my paper order form (it’s all tonkotsu broth with non-curly noodles, but I could choose things like noodle firmness levels, broth spiciness, and add-ons), pressed the button for the server, watched his hand slide through and grab it (the bulk of the interaction I had with him throughout the experience), and then waited, at most, three minutes before my ramen bowl was slid back to me. It was certainly the most customized bowl of ramen I’d ever had -- unsure of what to opt for from the variety of things you could choose levels for (dashi, richness, garlic, noodle texture), I’d opted for “medium” across the board, except for the spicy red sauce, which I got at a level “2 (spicy)”. I also added on the chashu (sliced pork) and pork belly. All in all, that totaled to a hefty $18.90 (tip included), plus $9.90 for the pork belly. For some perspective, in Japan, a bowl at Ichiran will cost you $7. The broth wasn’t too rich or heavy -- my basic choices ended up being good ones -- and the added spiciness boosted the pork broth flavor. The pork belly was fatty and salty as it should be. But the most standout part of the bowl was the noodles, which were firm enough that they held up their texture in the broth, and plentiful enough that I didn’t need to ask for more to finish up my broth (you can opt for a noodle refill ahead of time when you’re ordering). This may not be the city’s very best ramen, but there’s absolutely nowhere in the city where you can get ramen this good so quickly. That’s really what makes the whole experience so appealing for New Yorkers -- by cutting out the talking to other people, you can get in and out and back to your office or out to meet your friends at the bar in a quarter of the time it would take you to have a regular meal at a traditional sit-down restaurant. Sure, service is a huge part of the dining experience (as is eating with other people), but there’s something to be said for allowing yourself to simply focus on the food by isolating yourself from the rest of the world for 20 minutes (or however long it takes you to eat ramen). One thing to note: you’re more likely to find a seat in the communal dining area than at a solo booth -- especially as the lines are still long -- but it’s worth it to wait for the latter. Oh, and be sure to grab some ramen to take home from the gift shop on your way out -- you can easily recreate the experience at home since you’ve already mastered being passive-aggressive towards your roommate. Lucy Meilus is Thrillist’s New York Editor and hates everyone except for Dame Maggie Smith, honestly. Follow her on Instagram.